As the world’s leading manufacturer of deep-cycle batteries, Trojan Battery Company supplies a wide range of energy storage solutions for renewable energy and backup power applications. 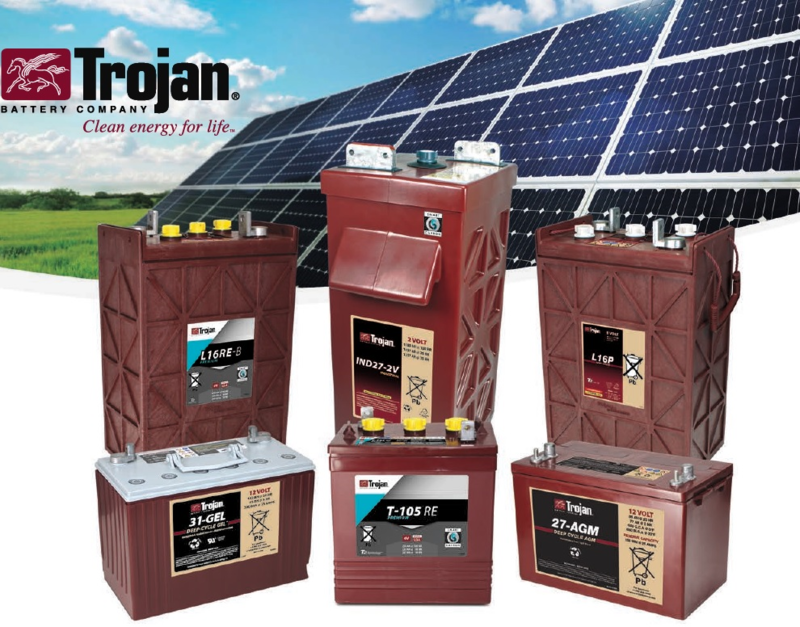 Having shaped the world of deep-cycle battery technology for more than 85 years, Trojan Battery’s pioneering research, development and manufacturing expertise has firmly established the company’s legacy of applying focused engineering expertise and innovation to addressing the needs of the global renewable energy marketplace. Today Trojan offers the broadest portfolio of high-quality, deep-cycle flooded, AGM and gel products. Remote home sites with no access to electricity, often depend on off-grid renewable energy systems to fulfill power rquirements. Trojan’s deep-cycle batteries enable these homeowners to optimize their renewable energy systems and provide a reliable, cost-effective power source to satisfy their home energy needs. Use of solar and wind power home systems are rapidly gowing as renewable energy technologies become more affordable and available worldwide. Families which have no access or limited access to electricity can now use lights, appliances, or other electrical devices in the evening or when weather conditions limit the energy production of solar or wind systems. Trojan batteries are the ideal energy storage solution for these types of offgrid renewable energy applications, providing reliable and cost-effective power and performance. Off-grid street and area lighting applications require batteries that can withstand the daily deep battery cycling inherent in solar applications. Many highway, traffic, parking, nighborhood and security lighting projects depend on Trojan’s deep-cycle AGM battery technology for long battery life and consistent performance day in and day out.